For all businesses, you can be part of this live event and more.. Becoming an event sponsor is a great way to enhance your brand and build trust, reach out to families and show your support to the community. This opportunity is open to ALL Businesses in the Greater Beaches Area who want to reach out to a family audience. Every year, we invite families from across the Greater Beaches Area to come and explore programs and services for their children. Being a sponsor will highlight you and your business in the community. Your business will be seen throughout all our media exposures, such as online, social media and video captures of the event. Full sponsorship gives your business multiple exposure including: your business will be seen by event attendees, reach out to over 20,000 Beaches|Life magazine readers as event sponsor, as well by online visitors to the event page. Your logo/business name displayed on a full colour event sponsor banner at the event. 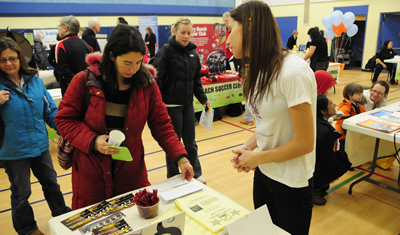 Space at the event information table to present your brochures, promotions or coupons for pick-up. Your logo or business name published in the Spring issue of our widely-circulated Beaches|Life magazine for your support to the community. A public “thank you” with event video and photos to be published online post event that will remain online for 1 year. Repeat promotion when we advertise the event next year. Your logo or business name will be promoted along with next event promotions. Alternatively, you can participate at this event by presenting your brochures, promotions, coupons at the event information display table. Your secure online payment is made through PayPal. You do not need a PayPal account to make a payment.